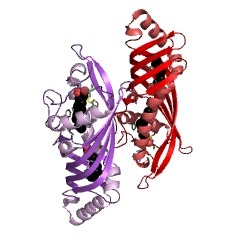 Juvenile hormone binding protein domains in insects. The juvenile hormone exerts pleiotropic functions during insect life cycles and its binding proteins regulate these functions. 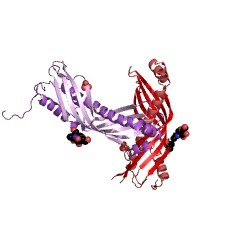 This family consists of several insect specific haemolymph juvenile hormone binding proteins (JHBP). Juvenile hormone (JH) has a profound effect on insects. It regulates embryogenesis, maintains the status quo of larva development and stimulates reproductive maturation in the adult forms. 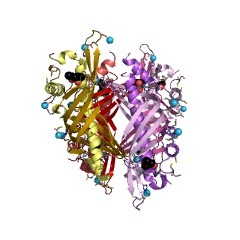 JH is transported from the sites of its synthesis to target tissues by a haemolymph carrier called juvenile hormone-binding protein (JHBP). JHBP protects the JH molecules from hydrolysis by non-specific esterases present in the insect haemolymph [(PUBMED:12595713)]. 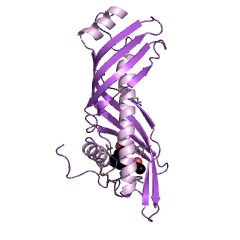 The crystal structure of the JHBP from Galleria mellonella (Wax moth) shows an unusual fold consisting of a long alpha-helix wrapped in a much curved antiparallel beta-sheet. The folding pattern for this structure closely resembles that found in some tandem-repeat mammalian lipid-binding and bactericidal permeability-increasing proteins, with a similar organisation of the major cavity and a disulphide bond linking the long helix and the beta-sheet. It would appear that JHBP forms two cavities, only one of which, the one near the N- and C-termini, binds the hormone; binding induces a conformational change, of unknown significance [(PUBMED:18291417), (PUBMED:8016136)]. 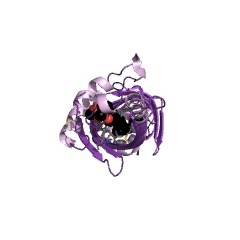 There are 3421 JHBP domains in 3294 proteins in SMART's nrdb database. Taxonomic distribution of proteins containing JHBP domain. This tree includes only several representative species. The complete taxonomic breakdown of all proteins with JHBP domain is also avaliable. Click on the protein counts, or double click on taxonomic names to display all proteins containing JHBP domain in the selected taxonomic class. The Drosophila takeout gene is a novel molecular link between circadianrhythms and feeding behavior. We report the characterization of a novel Drosophila circadianclock-regulated output gene, takeout (to). 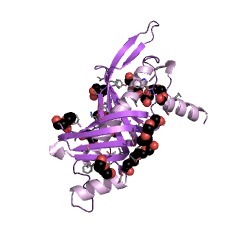 The to amino acid sequenceshows similarity to two ligand binding proteins, including juvenilehormone binding protein. to mRNA is expressed in the head and the cardia,crop, and antennae-structures related to feeding. to expression is inducedby starvation, which is blocked in all arrhythmic central clock mutants,suggesting a direct molecular link between the circadian clock and thefeeding/starvation response. A to mutant has aberrant locomotor activityand dies rapidly in response to starvation, indicating a link betweenlocomotor activity, survival, and food status. We propose that toparticipates in a novel circadian output pathway that conveys temporal andfood status information to feeding-relevant metabolisms and activities. 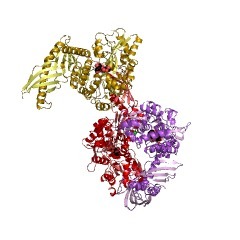 Biochemistry of proteins that bind and metabolize juvenile hormones. 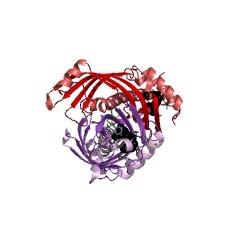 A diverse group of proteins has evolved to bind and metabolize insectjuvenile hormones (JHs). Synthetic radiolabeled JHs and theirphotoaffinity analogs have enabled us to isolate and characterize JHbinding proteins (JHBPs), a putative nuclear JH receptor, JH esterases(JHEs), JH epoxide hydrolases (JHEHs), and methyl farnesoate bindingproteins (MFBPs). Highlights of recent progress on structuralcharacterization of JHBPs and JHEHs of two lepidopterans will bedescribed. Efforts to identify MFBPs of penaeid shrimp will be discussed,and the discovery of a possible vertebrate JHBP will be presented. 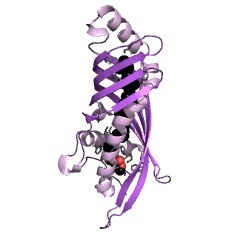 Binding specificity of the juvenile hormone carrier protein from thehemolymph of the tobacco hornworm Manduca sexta Johannson (Lepidoptera:Sphingidae). A series of analogues of insect juvenile hormone (four geometric isomersof methyl epoxyfarnesenate, several para-substituted epoxygeranyl phenylethers, and epoxyfarnesol and its acetate and haloacetate derivatives) wasprepared to investigate the binding specificity of the hemolymph juvenilehormone binding protein from the tobacco hornworm Manduct sexta. Therelative binding affinities were determined by a competition assay againstradiolabeled methyl(E,E)-3,11-dimethyl-7-ethyl-cis-10,11-epoxytrideca-2,6-dienoate (JH I).The ratio of dissociation constants was estimated by plotting competitordata according to a linear transformation of the dissociation equationsdescribing competition of two ligands for a binding protein. Theimportance of the geometry of the sesquiterpene hydrocarbon chain isindicated by the fact that the binding affinity is decreased as Z (cis)double bonds are substituted for E (trans) double bonds in the methylepoxyfarnesenate series; the unepoxidized analogues do not bind. Acarboxylic ester function is important although its orientation can bereversed, as indicated by the good binding of epoxyfarnesyl acetate. Inthe monoterpene series, methyl epoxygeranoate shows no affinity for thebinding protein, but substitution of a phenyl or p-carbomethoxyphenylether for the ester function imparts a low, but significant affinity.These data taken together with earlier results indicate that the bindingsite for juvenile hormone in the hemolymph binding protein ischaracterized by a sterically defined hydrophobic region with polar sitesthat recognize the epoxide and the ester functions.